Want to offer promotional literature with an accommodating device recharging station? Charging stands with brochure pockets are great for attracting attention to pamphlets and magazines. These device power kiosks provide passersby in malls, office lobbies, and convention halls with a chance to recharge their device. 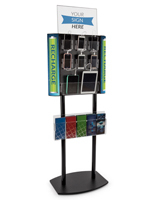 The charging stands with brochure pockets are easy to recognize from a distance, making them ideal for open areas. 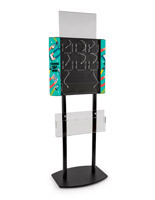 Choose these floor standing literature displays to dispense catalogs, pamphlets, and magazines while accommodating modern consumers. 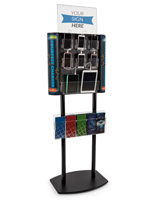 Our charging stands with brochure pockets will give everyone a reason to check out your promotional campaign. 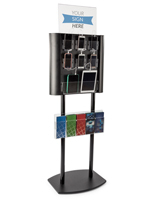 What makes these phone recharging stations great for promotion? Our charging stands with brochure pockets includes common cords for recharging the most popular devices. Each display includes three Micro-USB, three Lightning, and two USB-C cables to accommodate both Android and Apple users. Whether you're reaching out to consumers with phones or event attendees with tablets, you'll be prepared! The front panel locks to protect the cords from theft. Each charging stand with pockets for literature has a sign header that's great for pointing attention to your marketing materials. With signage like "Charge Here" or "Recharge Station," it's easy to get people to notice the service you're providing. Alternatively, this poster frame can be used to the company's logo at a trade show, building brand presence around the exhibitor booth. Charging stands with pockets for pamphlets and magazines are available with custom graphics for a fully personalized fixture. This is a great way to feature your company logo and promotional messaging. These custom graphic panels feature high quality digital printing that creates full color images out of customer provided artwork. The floor standing kiosks all have clear acrylic pamphlet slots for making promotional materials highly visible. Both custom signage and literature covers will be easy to see from a distance. In addition, each slot has removable dividers that can hold an 8.5" wide catalog where two 4" wide pamphlets will go. 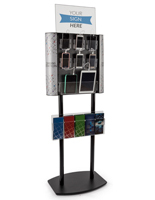 Phone charging stands with literature racks benefit passersby, building a positive image of your brand. Accommodating consumers' modern devices is becoming more and more important in the modern connected world. Smartphone and tablet users at trade shows and commercial events will be thankful to have their batteries filled. Giving customers in hotels, banks, and department stores a chance to recharge puts their mind at ease. Browse our other floor standing recharging stations for modern accommodation fixtures with high visibility. 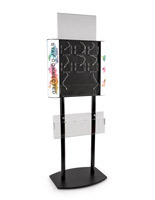 Charging stands with catalog slots are excellent for welcoming prospective customers to your brand and its message.